Yes I know we were in Broome in April about a month ago but I have had so much trouble with blogpress and then blogger from my phone and i pad that I just gave up in disgust. So I have things to catch up with - I like to write on my blog becasue I also use it as a diary and have each year published in a book. not that I have done last year's as yet. Where does each day go? This is a piece I started in Broome - it is a print out collage of some of my stitching on Tissutex bonded to felt and stitched, I haven't progressed any further as yet. in Broome there is quite a large Japanese cemetery where we took quite a few photos - mine for an article I am wriitng before toolong. I do have a request from anyone reading who might have one or two Japanese paper napkins. If you were kind enough to send me some I will return with a parcel of threads. I am particulalry after ones with people on but as I have none I am open to anything exciting. Lots of these headstones have been broken which is dreadful so you can see the cracks where they have been mended. On our last night we went to the Sunset Cafe at Cable Beach for a glass of wine to watch the sunset. I was given strict instruction to sip very very slowly my undernourished glass of wine - and looking at the food menu and what was actually going out gave a shock as well. You pay for location that is for sure. We returned to cook a wonderful bbq of course but it was lovely to watch the sunset once again. You can check it out next August if you came to our Broome Arty Retreat which we are working on the organisation of. We did have a dramatic ending to our wee holiday - we usually fly back on the 1pm plane and this year had made the decision to catch the 10.20 one. Of course that was forgotten and we were gayly getting ready for a swim at 9.40 when Ian decided to check the tickets to see what time and boy did we pack and move out as fast as - but all to no avail - we were 1 minute late checking in and no way would they take us. Not to mention the extra $190 we had to pay. Apparently the plane was only half full. Anyway it could have been worse - could have been an international connection. 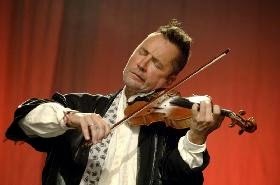 and of course I had my big birthday treat later in the month going to the Nigel Kennedy concert. He was brilliant and his band was brilliant too. I believe the critic gave the concert 5 out of 5. Wonderful. So my time until I went to New Zealand was spent gathering bit for my talk for the Rose City Tote and Gloat and creating things etc. The above picture shows my packing and I must say it was pretty good to return home to a basically clean big table. Must try that again. I am putting together a Marrakesh book working mainly on Tissutex Plus - I really do love this fabric paper. Here is another page. Some times I use the gelli plate but others I stencil and spray and stitch. I think i will write about my how tos in one of the articles for Issue 5 - maybe or maybe not. On the last day of May I flew to Auckland and caught an early flight to Wellington. We arrived in Auckland well before 6am and the short walk from the international to domestic is very refreshing after sitting on a plane for hours - Mt Egmont - whoops Taranaki - was looking superb as we flew over and you could see all the towns clearly. Very green - very nice. I collected a hire car and drove to Wanganui where I met up with some very helpful and lovey ladies at the Heritage Library. I discovered all sorts of new things about my maternal granny and since then have collected more from someone else who is a distant cousin. I am gathering little folders of info and stuff for my Letters to the Grannies - my sister gave me a couple of postcards my maternal granny had written to my mother - it is a shame htey didn't tell us anything but as my brother said - we weren't interested and didn't ask. Then on Sat I attended the Gloat and Tote - there were over 400 people there -in the morning they display and talk about tier quilts - so many whizzing by before my eyes. This is one which I liked. I think the colours were after me. And in the afternoon I gave my talk. the following two days I taught and I will show this work next blog. Just reading about everything you fit into your life makes me feel tired! In spite of your 'big' birthday you still have youth on your side and I love to see all your gorgeous photos. The stitched piece and Marrakesh book are beautiful.